Also known as the Sears House because it was built from a Sears and Roebuck kit by Robert A. Mercer, son of the original settler in the early 1900s, it was one of the few buildings to survive the 1919 hurricane and the strong winds of Hurricane Cecila. It is one of the city’s oldest and most intact residences recalling its early 20th century history as a port community. It was moved once to the corner of Roberts and Oleander, where it now stands. An out-of-town developer bought it in 2006 and plans to demolish the house to make room for a 16-town house complex unless it can be moved again. The nonprofit Port Aransas Preservation and Historical Association (PAPHA) was offered the property first, but the organization was unable to raise the required purchase price of $625,000. The current owner offered the house to PAPHA if they move it. PAPHA is trying to raise funds to save this unique house that holds so many holiday memories for the community, to convert it into a house museum. UPDATE: The Mercer House was built from a Sears and Roebuck kit by Robert A. Mercer and is one of the oldest buildings in the city of Port Aransas. In 2006, the house was purchased by an out-of-town developer who planned to demolish it to construct a town house complex. 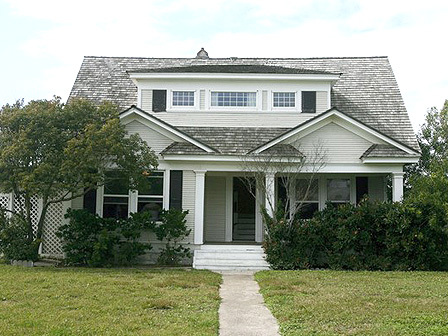 The Port Aransas Preservation and Historical Association (PAPHA) recently reported that the house will be moved to a new site on the grounds of the Community Center. The Community Center, built in 1939, will be restored by the Boatman’s Association and new landscaping is being planned by the garden club. The move will take place as soon as the water table goes down in order to construct the piers for the foundation. The relocation of the house would not have been possible without the work of PAPHA and its partners. Funds to move the house were raised by PAPHA and many skilled craftsmen volunteered their time to do the actual work. PAPHA enlisted the help of the City of Port Aransas to ensure that the move would be possible. PAPHA has also contracted with Southwest Museum Services for the restoration of the interior and for exhibit design.